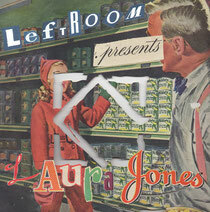 Featuring exclusive remixes from Ryan Crosson (Visionquest), Gavin Herlihy, Matt Tolfrey & Sam Russo and tracks/remixes from the likes of Floppy Sounds, Kate Simko and Guy Gerber, ‘Leftroom Presents... Laura Jones’ sees the Leeds based DJ/producer turn in a mix that neatly displays her affection for a variety of sounds. Debuting on Leftroom last year with ‘Intentions’, Jones has gone on to become a genuine artist to watch with releases for Crosstown Rebels and Visionquest swiftly following. Employing the same deft touch and keen ear as with her studio work, Jones’ DJing has taken her across the globe, solidifying a formidable reputation. Kicking off with the brittle, washed melodies of dOP & Masomenos’ ‘Hello!’ before slipping into the dense soundscape of Soulade’s ‘Forza da Chuva’ and the haunting, broken Youandwan remix of Homeboy ft Anshie, Jones’ penchant for absorbing tones and contrasting rhythms is clear. As the grooves tighten, they do so without the expense of emotive content, with each track taking a distinct, musical role in the mix and creating a flowing, engaging narrative. Stripped, raw grooves like Tolfrey & Russo’s remix of Jones’ own ‘Intentions’ sit alongside moody, future retro synth work courtesy of My Favorite Robot while more aggressive vibes from Gavin Herlihy (remixed by Ryan Crosson) provide peak time moments. Still toying with textures and rhythms as the mix reaches its closing section, Jones segues work from Matt Tolfrey & Maher Daniel, Giorgio Luceri and Floppy Sounds, highlighting each track’s varying takes on classic electro influenced house while simultaneously showcasing their differences before rounding things off with ‘The Mirrorgame’.